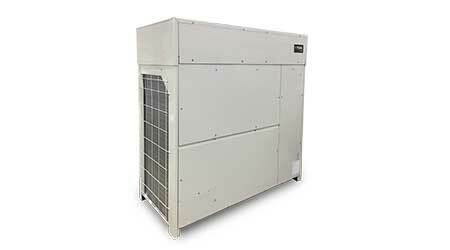 YORK Variable Refrigerant Flow (VRF) Gen II offers many enhancements including a re-engineered outdoor unit line with an impressive operating range and a wider selection of single module sizes and an indoor unit line that includes re-engineered ducted units with greater static pressure, a full range of multi-port change-over boxes for heat recovery systems and enhanced controllers. The line has an extended operating range with cooling down to an ambient outdoor temperature as low as -4 F with the low ambient kit and as high as 122 F. The heating operating range extends from an ambient outdoor temperature of -13 F to 59 F.
For further flexibility, single modules are now available in 6-, 8-, 10-, 12-, 14-, and 16-ton capacities enabling heat pump or heat recovery systems up to 36 tons to be configured more economically. In addition to offering higher-static ducted indoor units in multiple sizes, the lineup also includes non-ducted units in more capacities. The line offers a full line of change-over box options: single-port change-over boxes in two capacities and multi-port change-over boxes with 4, 8 and 12 ports for more heat recovery system design options. The Johnson Controls VRF Smart Gateway completes the package. With the gateway, VRF system point data is discovered, resulting in full system data in familiar naming and graphic formats within the BACnet Building Automation Systems (BAS).